Hey I was wondering if anyone knows how to get Full screen in Scummvm on Macbook? 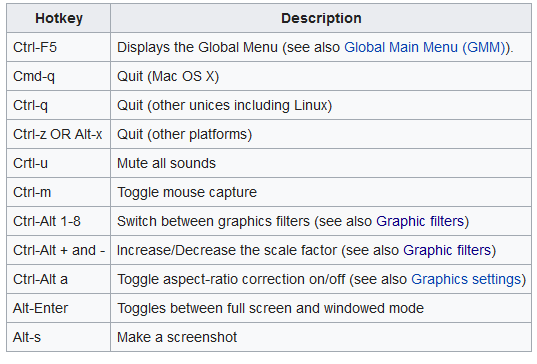 That’s the PC shortcut for switching between fullscreen and windowed, so I’d imagine something similar would work on mac. Yes thank you it worked, unfortunately it’s not actually fullscreen, it’s the same tiny screen but now the rest of the screen is black. So guess I just have to install the old game instead and try to play it instead of GOG. Did you try the suggestions here? Thanks for the tip, I had not tried that, unfortunately it had no effect at all. I still have the original games it’s just I’d love to be able to play on my macbook instead. But it seems like it would be less work just installing them on a PC again. Never mind spoke too soon, now my PC is saying it can’t read the app or whatever when I try to install Space Quest 6 on my computer, even though I ask it to run in windows 98 mode and 256 colours. Installing adventure games is a science in it’s own. No game play will ever come close to being as difficult as that. I recommend you use ScummVM for Space Quest 6 too. Once you have that virtual machine properly set up, you can run a huge amount of old games with it. I am using Scummvm for Space Quest, that’s why the screen is so small, I would show you how small it really is but the site won’t allow me to upload a screen shot. Have you tried to use the scale shortcut keys? Hahaha okay so finally the game works perfectly, thanks!! Was a bit slow, but turned out it was on 0 in settings and sound was gone, but came back after a couple of re-starts. So now I have no complaints, it’s perfect! FINALLY! !...except for when I play the arcade game, as soon as the game is over, the game crashes .